American Dreams - Coreopsis rosea - This coreopsis differs from the norm in that it can tolerate, and even likes, damp conditions. Good butterfly flower, it blooms all season. Compact, uniform habit. Full sun or partial shade; height: 36in. Baby Gold- Coreopsis lanceolata 'Baby Gold' - Perennial - Pure yellow daisy blooms on compact plants. Everblooming from May to October. Full sun orpartial shade; height: 16in. Golden Wave Coreopsis - Coreopsis basalis - Annual; This annual wildflower variety has a stunning mass of fragrant, bright yellow blooms with a mahogany center. Likes full sun. Native to Southeastern and South Central US. Gorgeous in mass plantings. Full sun; plant height: 24in. Mahogany Midget - Coreopsis tinctoria - Annual; This variety sports deep red blooms with a golden center eye. Good pot plant, as it remains compact and blooms throughout the heat of the summer. Full sun; plant height: 10in. Moonbeam - Perennial; Pale 1-2/in. single yellow blooms abound on mounded fernlike foliage, making this a perfect border or basket plant. Full sun or partial shade; Hardy to -30F (-34.4C); height: 18-24in. Plains Coreopsis - Coreopsis tinctoria - Perennial; Tall plants bear a profusion of bright yellow single blooms with red centers. Foliage is lacy and fernlike. Beautiful cottage garden addition. Native to the Southern US. Full sun or partial shade; Hardy to -30F (-34.4C); plant height: 36in. Red Plains Coreopsis - Coreopsis tinctoria - Annual; easily grown from seed, this native wildflower variety thrives in a variety of soils and conditions, including damp areas. Blooms are mahogany in color and are borne in profusion. The plant is ideal for mass plantings or wildflower areas. Full sun; plant height: 12-24in. Sunburst Coreopsis lancelata- Perennial; Golden yellow semi double blooms on upright stems. Booms first year from seeds. Full sun or partial shade; Hardy to -30F (-34.4C); height: 36in. Sunray - Coreopsis tinctoria - Perennial; Fully double golden yellow blooms on dwarf plants. Blooms second year from seed. Full sun; Hardy to -30F (-34.4C); plant height: 12in. Tickseed - Coreopsis laceolata - Perennial; This is the wildflower variety whose bright yellow single blooms on 3ft. stems lend an airy beauty to any garden or hillside. Does well even in hot dry summers. Full sun; Hardy to -30F (-34.4C); plant height: 36in. 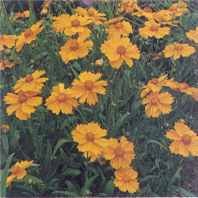 Coreopsis are hardy annual and perennial plants belonging to the Daisy family, Compositae. They bear bright long stemmed flowers ranging in color from pale to dark yellow to mahogany, some with bicolor markings. The plants thrive in ordinary garden soil in a sunny place. Most are drought tolerant and some varieties are tolerant of wet soils. There are several wildflower varieties native to the US and Canada that are grown for gardens. They make a lovel show in mass plantings and are also good for bedding or borders. Propagation is done either by sowing seed or by division. To sow seed FOR TRANSPLANTS: Sow seed in pots or trays. Cover seed lightly as light aids in germination. Keep moist at 75F. Transplant seedlings when they reach 2 inches tall. Plant outdoors when all danger of frost is past, spacing 12-18inches apart each way, depending on variety. DIRECT SOW: Sow seed in prepared area. Barely cover or broadcast seed and rake lightly into the ground. Keep moist until seedlings emerge.. Keep weeds down to encourage growth. 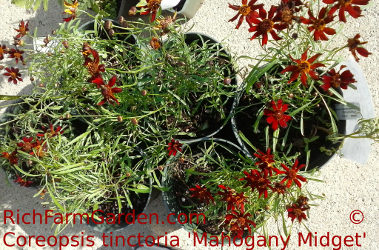 Coreopsis are an excellent choice for bees and butterflies. The seeds have been used as a substitute for coffee and a tea made from the roots has been used to treat diahrrea. An old wives tale suggests the drinking tea made from the roots can help pregnant women produce a female child.